LAFAYETTE, Ind. 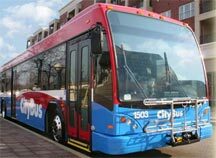 — CityBus has released information regarding detours in effect on Sunday, December 6, 2009 due to street closures in downtown Lafayette and the Wabash Landing/Levee area for the annual Lafayette-West Lafayette Christmas Parade. Will operate normal Sunday schedule until 1PM. After 1PM, the inbound buses will use Ferry St. instead of Main St.
Will operate normal Sunday schedule until 1 PM. After 1PM, outbound buses will take 4th St. north to the Harrison Bridge, left on River Rd., right on State St. Inbound buses will turn left on River Rd. from State St., and then take the Harrison Bridge to the 3rd St. exit, to the downtown transfer center. Stops in the Levee/Wabash Landing area will not be served while the detour is in effect. Will operate normal Sunday schedule until 1 PM. After 1PM, outbound buses will take 4th St. north to the Harrison Bridge, left on River Rd., left on State St., and resume route in downtown Lafayette. Inbound buses will follow 18th St. to left on Salem, Left on 9th, Right on Cincinnati. Inbound bus stops along Main St. will not be served. Will operate normal Sunday schedule until 1 PM. After 1PM, outbound buses will go to West Lafayette on the Harrison Bridge, left on River Rd., left on State St., and resume route in downtown Lafayette. Inbound buses will turn right on 18th St., left on Salem, Left on 9th, Right on Cincinnati. Inbound stops along Columbia St. will not be served. 7 St. Rd. 26 E.
Will operate the normal Sunday schedule until 1PM. After 1PM, outbound buses will turn left at 9th, right at Union, right on 18th, left at Cason, and follow the road through Murdock Park to Ferry St. Inbound bus will turn from Ferry into Murdock Park, left on Cason, right on 18th, left on Salem, left on 9th, right on Cincinnati. Bus stops on Ferry St. between 9th and 18th St. will not be served. Buses will continue to hold for transfers along Third St. in downtown Lafayette before and during the parade.